No matter how skilled they are, starfighter pilots can only do so much from the cockpits of their individual ships. Seeking to overcome these limitations, the Separatist Alliance takes a novel approach to space combat. Rather than “traditional” organic pilots controlling only a single ship, they turn to groups of interlinked droid starfighters that share tactical data in real time and coordinate their movements to overwhelm their enemies. 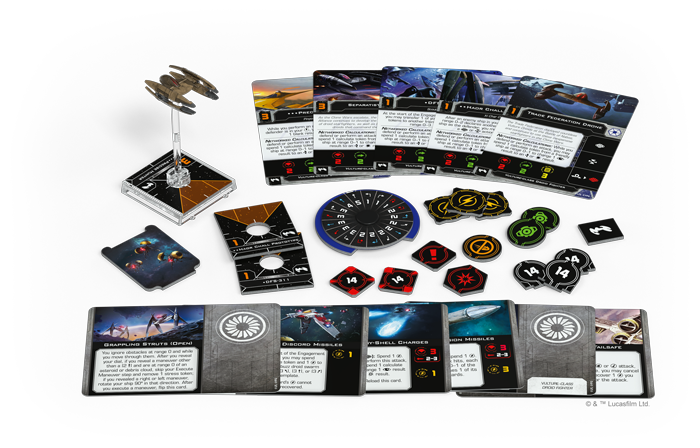 Order your own copy of the Vulture-class Droid Fighter Expansion Pack at your local retailer or online through our website today! At the heart of these attack groups is the Vulture-class droid fighter. While weak in isolation, a sufficient number of these fighters can quickly become too much for even the most experienced pilots to handle. Already capable of precise combat calculations, Vulture droids become even more deadly when they’re fed additional tactical data from supporting command ships. 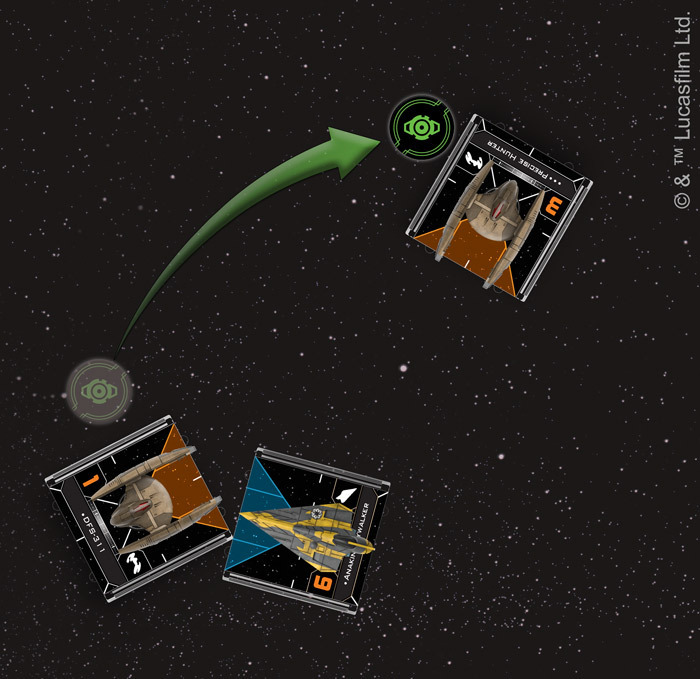 Soon, you’ll be able to make these droids the cornerstone of your own strategies with the Vulture-class Droid Fighter Expansion Pack for X-Wing™! 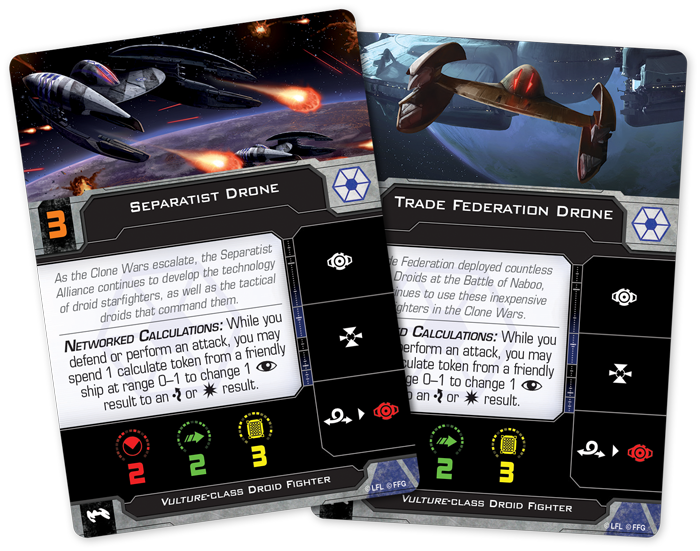 Within this expansion, you’ll find one Vulture-class droid fighter miniature, beautifully painted in the colors of the Trade Federation as well as five ship cards representing different programming styles for you to employ in battle. You can further shape your Vulture droid to fit your personal strategy with five upgrade cards. Join us today as we explore everything included in the Vulture-class Droid Fighter Expansion Pack! There is a clear distinction between two different classes of starfighters within Separatist Alliance squadrons. On the one hand, the faction’s leaders take to battle in powerful and heavily armored starfighters, such as the Belbullab-22 and Sith Infiltrator. On the other hand, you’ll find the weak droid starfighters that make up the vast majority of the Separatist forces. Expected to take the brunt of enemy fire, these droid fighters can play a number of roles in your squadron. can react to some enemy movements and make good use of the information relayed to them from the tactical droids carried on command ships. into the enemy’s flight path. Once launched, these missiles deploy an aggressive buzz droid swarm, ready to latch onto an enemy ship and tear it apart from the outside. The Delta-7 Aethersprite moves through the Buzz Droid Swarm, relocating the swarm to its rear guides. As long as they are at range 0, the Delta-7 will suffer one critical damage every time the buzz droids engage! must immediately relocate it by aligning the buzz droids to that ship’s front or rear guides. While this doesn’t have an immediate effect, the buzz droid swarm will soon set to work, causing each enemy ship at range 0 to suffer a critical damage every time it engages. With an initiative of 0, however, the buzz droids are still vulnerable to an attack that could blast them off the ship before they get a chance to do any damage. Even still, they are dangerous enough to draw the enemy’s attention away from the rest of your ships, giving you plenty of opportunity to attack. can help your other ships that have a better chance of making a powerful attack. At the start of the Engagement Phase, DFS-311 transfers its calculate token to the Precise Hunter! line up the shot it needs and give it the calculate it needs to modify the results. 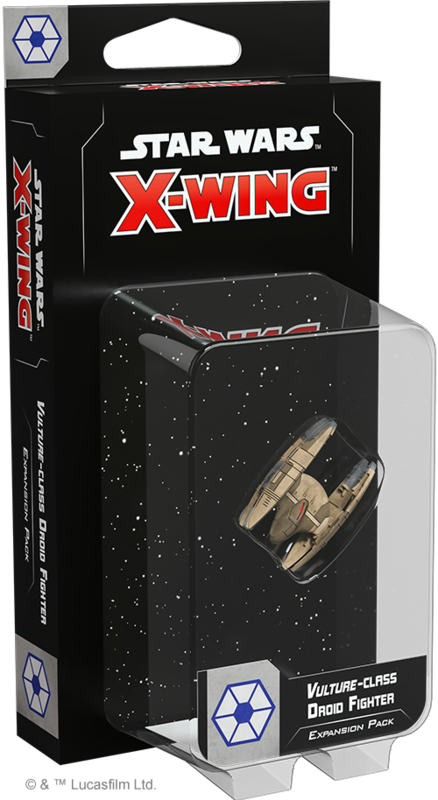 No matter if you blitz your enemies with a large squadron of Vulture-class droid fighters or you pair them with another ship and a tactical relay, they are a versatile fighter key to the Separatist’s success in the intense battles of X-Wing! The Separatist Alliance seeks to splinter the galaxy with chaos, tyranny, and fear, and the Vulture-class droid fighter is their main tool in accomplishing this goal. Deploy yours and topple the Republic! The Vulture-class Droid Fighter Expansion Pack (SWZ31) is releasing alongside the rest of Wave III in the first quarter of 2019. Pre-order your copy at your local retailer or through our website today!